Patients who have excess gum tissue may qualify for crown lengthening at our Woodinville, WA dental practice. During this laser dentistry procedure, excess gum tissue is removed to expose more of the natural tooth structure underneath. Crown lengthening can be performed to address cosmetic concerns, to prepare a tooth for a new restoration, or to make an area easier to clean. Individuals who undergo this treatment can choose from a wide range of sedation options for their comfort, including nitrous oxide, oral sedatives, or IV sedation. Here, our team at Signature Smiles discusses crown lengthening candidates, and explores the different techniques offered at our practice. Anyone who has aesthetic or health concerns about excess gum tissue may qualify for crown lengthening. Because crown lengthening is a surgical procedure, eligible patients should be in good general health and free of any medical conditions that could make oral surgery a potential risk. Furthermore, patients should have a full understanding of the treatment process and reasonable expectations of results. During an initial consultation at our practice, your doctor will discuss crown lengthening with you in detail. In addition, you will be provided with a detailed list of pre- and post-operative instructions so you can know what to anticipate during the treatment process. Do you have a gummy smile? 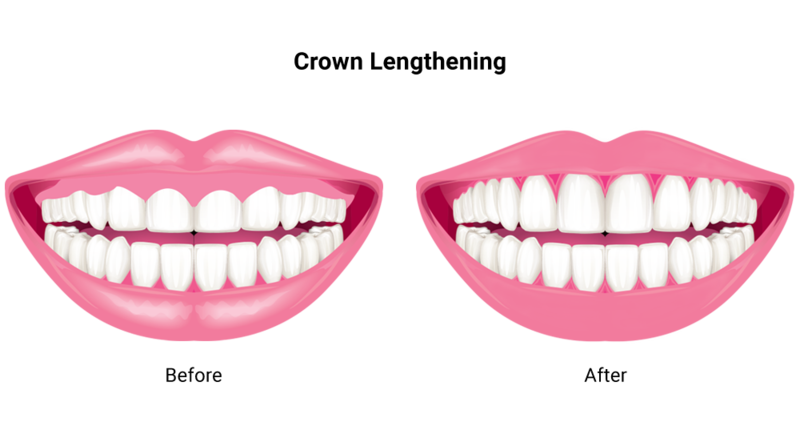 Do your teeth look short or boxy? Does your gum line look uneven when you smile? If so, you could be a candidate for cosmetic crown lengthening. Also referred to as gum contouring, this procedure involves strategically shaping the gum line for a more balanced and symmetrical appearance. Using advanced laser energy, excess gum tissue is removed. Because our soft tissue diode laser cauterizes as it cuts, patients experience significantly less post-operative bleeding, swelling, and discomfort. Patients considering this treatment should have healthy teeth and gums. If tooth decay or periodontal disease is present, these conditions must be treated first, as they can seriously hinder the results of your treatment. Individuals should also understand that their unique anatomy plays a role in candidacy for this procedure. For example, gum tissue cannot be removed past the cementoenamel junction (CEJ). This line is where the crown of the tooth meets the root. Removing too much gum tissue would result in root exposure, which would be counterproductive to your overall oral health. In these instances, however, cosmetic crown lengthening can be combined with porcelain veneers or dental bonding for a more dramatic result. Your doctor can develop a personalized treatment plan appropriate for your situation. Crown lengthening can also serve many restorative purposes. For example, if a tooth is fractured below the gum line, then crown lengthening can effectively remove enough gum and bone tissue to access the affected area. Additionally, crown lengthening may need to be performed prior to receiving a new restoration. For example, excess gum tissue can prevent a dental crown from fitting correctly. Functional crown lengthening provides a stable, healthy foundation for your restoration. In addition, excess gum tissue can cause bacteria to harbor beneath the gum line. Functional crown lengthening can make these hard-to-reach areas more accessible so they can be reached effectively through routine brushing and flossing. To learn more about crown lengthening, or to explore your candidacy for this procedure, schedule a consultation at our practice. Contact us online anytime or give us a call at (425) 489-1177.